Ch-ch-ch-changes for me — and Pear Tree! Entering Pear Tree’s ninth year, there’s been some super positive changes! First, after being solely self-employed over the past nine years, over a month ago I started working at my dream job – in the editorial department of a magazine! It’s such a blessing to be working with such a great team too. So, what does that mean for Pear Tree? It means that Pear Tree will still be going strong! I am still freelancing for Vitamin Retailer, still helping others write their books, and giving lectures. The only difference is that lectures will be held solely on weekends. It also means that while I’m a supersonic wonder woman who loves to work, I’ll also be taking some well-deserved vacations and time off. That said, there may be a bit of a waiting list for ghost writing/book editing, but be assured, that as always, Pear Tree is the business to call on! I have my dynamite copy editor Cynthia Santiglia helping me out; as well as a new team of vocalists assisting me with my Learn & Listen series. So, give a big Pear Tree welcome to Doreen Brusca Arminio, who will be my new Ella Fitzgerald; and Morissa Schwartz, who will be my new Janis Joplin. Change is a good thing – embrace it! And let’s not forget my third book “The Gypsy Smiled” will be out later this year. GenZ Publishing is shooting for October. NOTE: Due to a highly productive schedule, Pear Tree had to cancel some lectures this summer. Pear Tree apologizes for any inconvenience. Every Wednesday for the month of July we had a “waiting list” as the library was filled with 50 people each week. Needless to say, we had a blast! So, this month’s Pear Tree is dedicated to Fran Larkey, who made it all happen. With very special thanks to my entertainers: Ruben Castillo (Elvis Presley); Keith Beck (Johnny Cash); and last but certainly not least, Stephen Fuller (Frank Sinatra and Nat King Cole). The series was so successful it made the cover of the Caldwell News! Taking a much needed break for August! Check back in September! 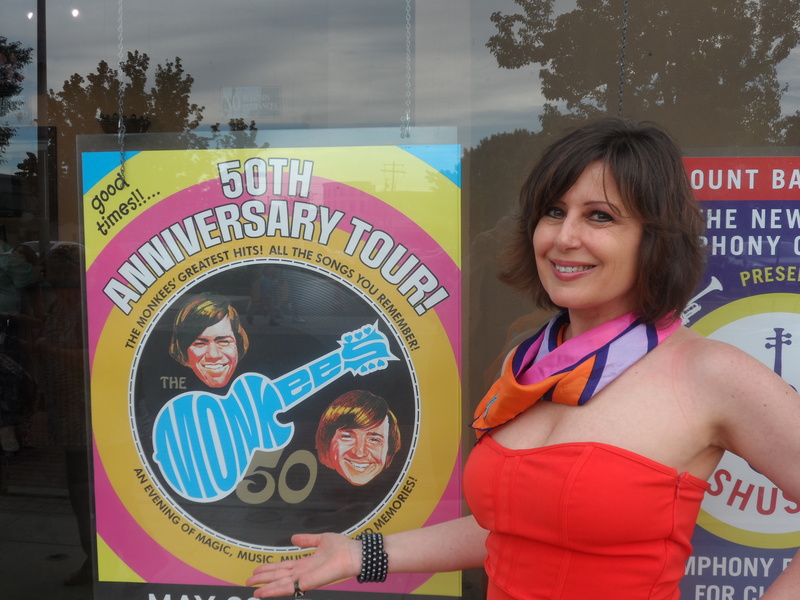 Me, outside of Count Basie Theatre, for The Monkees show! Reading and Music are the best parts of summer! “‘Come with me,’ Mom says. “Learn & Listen Series Presents the Life and Music of David Bowie (featuring Keith Beck)” Friday, June 3, 2016, 6:30 p.m. Boonton Library, Boonton, New Jersey. Free to public. “Going, Going, Gone: What the Next Generation Won’t Remember” Wednesday, June 8, 2016. Pompton Lakes Carnival Center, Pompton Lakes, New Jersey. Private event for seniors. “Raw Food for Beginners” Saturday, June 11, 2016, 1 p.m. Fairfield Library, Fairfield, New Jersey. Free to public, but most call to sign-up – limited to 20 people. “Love Cats – Book Reading/Signing” Tuesday, June 21, 2016, 7 p.m. Fairfield Library, Fairfield, New Jersey. Free. Signed copies of “Love Cats” are available for $20. Proceeds of sales will go to my non-profit organization R.O.A.R. (Respect Our Animals’ Rights) to benefit various animal groups. “On the Guest List: Adventures of a Music Journalist – Book Reading/Signing Tuesday, June 28, 2016, 7 p.m. Fairfield Library, Fairfield, New Jersey. Free. Signed copies of “On the Guest List: Adventures of a Music Journalist” are available for $20. “Learn & Listen Series Presents the Life and Music of Johnny Cash (featuring Keith Beck)” Friday, July 1, 2016, 6:30 p.m. Boonton Library, Boonton, New Jersey. Free to public.